Happy Saturday! Truly the world is filled with adventure. Opportunities to travel, to try new things, be thrilled by experiences…to improve our lives, to better our communities, to support our families…to share your faith boldy. 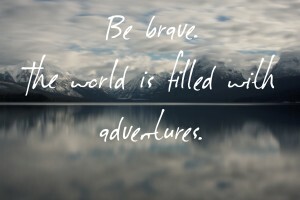 What is your adventure? If you could do anything, what would it be? Are you afraid? What if you weren’t? What would you do if you weren’t afraid? Be brave. Now’s the time.